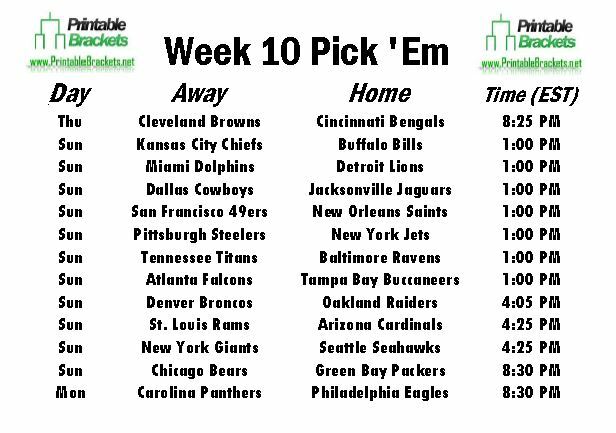 In-state rivals kick off Week 10 as the Cleveland Browns will clash with the Cincinnati Bengals on “Thursday Night Football.” If you run an office pool or a pool with your friends and family, download and print off our NFL Pick Em Week 10 sheet. This sheet is absolutely free courtesy of Printablebrackets.net. An all-Ohio showdown gets things started in Week 10 of the season. The Bengals and Browns have been battling for Ohio supremacy for years and split last season’s meetings. The Browns notched a 17-6 win at home in Week 4, while the Bengals got revenge at home in Week 11 with a 41-20 thumping. Cincinnati went on to win the AFC North with a record of 11-5. There are seven early Sunday games on the NFL pick em Week 10 sheet. The San Francisco 49ers and the New Orleans Saints will continue their recent rivalry in the Superdome. The New York Jets will also welcome Ben Roethlisberger and the Pittsburgh Steelers early Sunday. In late action, the defending Super Bowl champion Seattle Seahawks will square off with the New York Giants. The Denver Broncos will be on the road to face the longtime rival Raiders in Oakland. Sunday’s action on the NFL pick em Week 10 sheet wraps up with the longest rivalry in the history of football. Aaron Rodgers and the Green Bay Packers will host Jay Cutler and the Chicago Bears on “Sunday Night Football”. Week 10 of the 2014 season concludes with Nick Foles and the Philadelphia Eagles hosting Cam Newton and the Carolina Panthers on “Monday Night Football”. Six teams will get to enjoy their bye in Week 10. The Indianapolis Colts, Minnesota Vikings, New England Patriots, San Diego Chargers, Washington Redskins and Houston Texans all have the week off.